#G106* – YET ANOTHER NEEDLESS POLICE MURDER! The Behaviour of The British Police Is Morally Reprehensible & Totally Unaccesable. 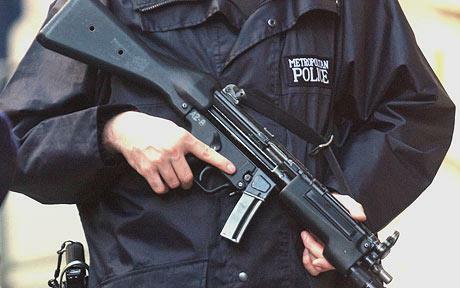 There is no valid case for an armed Police – to date not one single uninvolved life has been saved by a Police Murder. #G103* – ANOTHER POLICE MURDER ADDED! #G092* – A YELLOW TABARD & YOU ARE ABOVE THE LAW! playing with a fire in a disused industrial site. who increasingly have authority in Britain! THEY ARE A STATE ENFORCEMENT AGENCY!!! Of the law itself – clearly the obscenities of Corpus Juris are to surplant British Law. You will note in the original documentation of The EU DG de Juste ISBN 2-7178-3344-7 by Mireille DELMAS-MARTY on page 40 paragraph 3 ends: ‘….,designed to ensure, in a largely unified European legal area, a fairer, simpler and more efficient system of repression‘. It is astonishing how often this new style of State enforcement Law uses the word repression. Armed officers were called to the rear of a terraced house in Cheapside, Shildon, County Durham, after bolts were randomly fired from a back window before 1am today. A Father shot and killed in the home he, it is believed, was about to have repossessed – distressed and possibly drunk at 1am. did not leave the house. Even a police officer could be expected to know that he was at no risk if he waited for developements out of range or at most fired 1 cannister of CS into the house! Yet again poorly tained police over reacted in a macho and irresponsible way and the man was MURDERED by armed Police at C01.00hrs. PROSECUTIONS: Not based on the normal cover up! Yet again the Police prove they are not competent to be armed – yet again Police murder a man due to incompetence – yet again the Police carry out a street execution of an innocent man acting as Judge and Jury. In a Country where no death penalty is permitted by law – why are the Police murdering innocent people? The individuals murdered are without exception innocent victims – not guilty of ANY capital crime as there is no such thing as a capital crime. There is absolutely no alternative but to define this as murder. With video cameras and not to mention 24/7 video surveillance of our lives by agents of the STATE a vicious street gang of out of control yobs are repeatedly caught on camera turning up at otherwise peacefull demonstarations to ruin the day and deny the people their right to peacefull protest. Protest is a fundamental human right in a free society – it is the first right to be suppressed by a Police State! You will note that in yet another film clip it is this gang who with their violent body language and their strident attitudes start fights and cause trouble. You will note in this clip that a not very large crowd of demonstarators, many with cameras or chatting on mobile phones are gathered, entirely peacably yet when one of the street gang moves along his own lines this shaven headed yob instigates violence by lashing out at one of the crowd. Meanwhile another of the yobs in black – also notably shaven headed is strutting up and down in body armour concealed largely by a yellow tabard, he is clearly looking for trouble and in frustration at the peacable nature of those around strikes out back handing a young woman to the head, a young woman who barely reaches his shoulder! (this yob seems to strike her twice – gratuitously the big brave bullyboy!) – without any provocation he draws a concealed weapon and starts to strike out at the legs of the woman and those around him although he is at no time threatened. All too often this street gang turns up at peacefull events and promotes or instigates violence. It seems that as our Police are increasingly politicised and irrationally armed (see my earlier blogs #G087* & #G001*) – they seem to have forgotten that they are the SERVANTS of the people and not their masters but increasingly as the standard of yob in politics slides inexorably into the gutter from whence so many of them came they form a team of terror that the public who pay their wages increasingly fear – there is little doubt that I am far more likely to die at the hands of my own police or as a result of Political incompetence than at the hands of the largely mythical terrorists who stalk this land!! As for my demise being as a sacrifice to the New World Order’s New Religion with its bi-polar god we must all worship, that is all too likely. Will it be at the hands of the god ‘Climate Change’ or his alter ego ‘Global Warming’. NEVER forget that no Government can tax its people if they have nothing to fear and clearly it is the Government we should fear most! Next Next post: #G107* – THEY WORK FOR YOU!!! !